MANUFACTURER: "Scott Dillon and Noel Ward created the blank from balsa board offcuts"
* Converted from Leigh Tingle's metric dimensions on the plans below. 4" x 5" base x 5.5'' span @ 0.5''. * Converted from metric dimensions on the plans below. 1958, John and family friend Barry Stark collect their first custom boards from Bill Clymer. A balsa pig for £28/-/- to John and to thirteen year old Barry Stark who lived at the Pittwater Road end of Pacific Parade a “Loomeroo” for £10/-/- (similar to a piopo board). - noted by Bob Green, August 2013, with thanks. These boards were built in balsa wood by many manufacturers in Australia, including Brookvale's Wallace Surfboards. 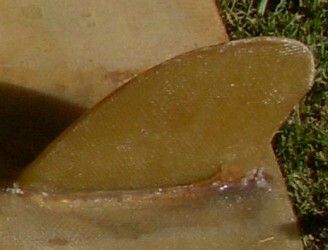 In Adelaide, Peter Crofton Surfboards built a similar twin-fin design but in foam, with multiple redwood stringers and without the hand-grip. 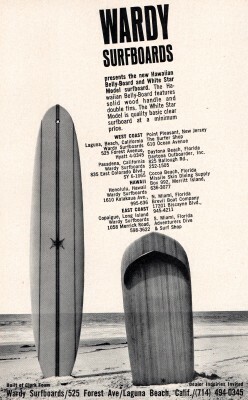 In California, they were still being made in balsa wood and advertised in 1965 by Wardy Surfboards of Laguna Beach, California. Wardy Surfboards presents the new Hawaiian Belly-Board ... features solid wood handle and double fins. Wardy Surfboards 525 Forest Avenue, Laguna Beach, California. Surfer, Volume 6 Number 5, November 1965, page 20. The photo at bottom of page of a bellyboard rider is me. 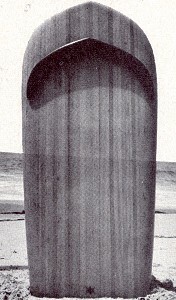 Taken at Haliewa Oahu January 1964 using an existing balsa fibreglass bellyboard made by Scott Dillon, Noel Ward and Gordon Woods in February 1958. It is now 43 years old and still going strong. If I remember correctly the photograph was from the Surfabout magazine. A replica of the board has just been finished by my son Sam for a school Tutorial Task. I have written to you before with regards to the photo in #113. That is me in the photo at Haliewa. Attached is a photo of the board as it is today. Scott Dillon and Noel Ward created the blank from balsa board offcuts and Gordon Woods shaped the board. The design is based on a bellyboard we saw in a movie at Coogee Surf Club in November 1957, (perhaps ridden by George Greenough?). The film seen by Leigh was probably Bud Browne's Surfing in Hawaii (1957) or The Big Surf (1957) which premiered at Queenscliff SLSC before an overflowing audience of 600, and were soon screening at other Sydney life saving clubs, and even in a tent at Whale Beach, where they were seen by a teenage surfer, Paul Witzig. - Thoms: Surfmovies (2000) page 69. Also note, when the American lifesaving representatives first appeared with their new Malibu boards at a public event, Cronulla Beach on Saturday 17th November 1956, they also had a short twin fin (?) belly board. It is possible Woods, or other builders, noted this board and later reproduced it when inspired by Browne's footage. It is 4 foot long and 21 inches wide and is covered with fibrelgass and with fibreglass fins. It has been reglassed three times and is now 51 years old. I still use it regularly, mainly at Curl Curl Beach, Sydney. In 1964 I took it to Hawaii and used it at Sunset, Waimea, Pipeline, Haliewa and Makaha. I have an MPG file of some of these locations with me riding the bellyboard. Others who were there at the time included Scott Dillon, Ross Kelly (was President of the ASA) Barry Kelly, Peter Troy, Barry McGuigan (Magoo), Midget Farrelly, Nat Young. Upon my return I was the Treasurer of the ASA and NSWSA for 6 years. Margan and Finney (1970), photographs pages 152 -156. Advertisement: Wardy Surfboards 525 Forest Avenue, Laguna Beach, California. Surfer Magazine, Volume 6 Number 5, November 1965, page 20. Leigh Tingle, Haliewa, January 1964. Fibreglassed balsa belly board with hand grip. Plans and metric dimensions by Leigh Tingle, July 2009. Geoff Cater (2008-2018) : Catalogue : Leigh Tingle's Balsa Bellyboard, 1958.